Culture, Heritage and Community: How one North East school uses the Pupil Premium to raise aspirations. 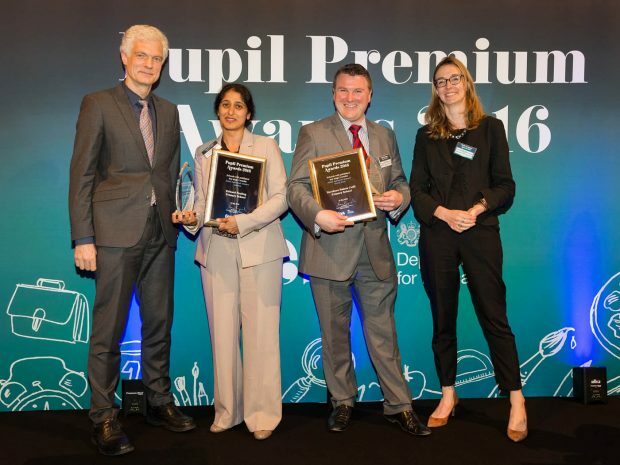 Everyone in the Northern Saints CofE School community was delighted to learn that we were joint winners of the National Pupil Premium Awards 2016 in the KS2 category. It’s wonderful that we have been recognized as excelling in the work we do to improve the life chances of our children, particularly the disadvantaged. Northern Saints is a fairly new, non-selective, Church of England primary formed from two predecessor schools that, it’s fair to say, had a variable history of results. One of the schools one had languished in Special Measures for a number of years, while the other was in the worst 200 performing primaries nationwide. The new school uses the Local Authority Admissions Code and we do not select by faith or prior attainment. With 517 pupils currently on roll and expanding to 3 form entry due to our popularity, we serve the immediate community, which is an area of social and economic deprivation. Half of our pupils are eligible for the pupil premium grant, with many others being classed as ‘working poor’. We receive just over £300,000 pupil premium annually which we aim to use in as many match-funded situations as possible. An excellent example of our match-funded work is that with The Outward Bound Trust. The Outward Bound Trust (OBT) is a national charity with a successful history of providing pupils with personal development through challenge, adventure and exposure to the outdoor wilderness. They taught us the concept of a 'life script' - the narrative we generate to guide our personal and professional lives, as we directly confront and assimilate new and challenging experiences.OBT training materials and lesson structures are now used both in school and at the centre to plan personal goals, identify strategies for learning new skills, achieve the unexpected and assess progress. In 2015/16 we are running nine residential programmes engaging over 108 key Stage 2 pupils, with a specific focus on disadvantaged pupils. As a direct result of the work with the OBT we also initiated a ‘Community Responsibility’ project for each year group which is central to our ever increasing character education offer. A central theme to the school’s work is the notion that the North East’s great heritage should propel us into the future with even greater aspiration. Our disadvantaged children lack that urgency for learning and inspiration to achieve and so we use the grant to provide a wide range of additional opportunities to get out into the local and regional area and use the plethora of museums, galleries and resources to increase lifelong aspiration. A good example is the strong partnership with Beamish Museum, one of the country’s leading working museums. Staff attend training days with the centre, use their materials and resource boxes in school and through carefully identifying barriers to learning, use planning sheets to target individuals who are struggling with learning. When classes then visit the museum e.g. to spend a day in the Victorian school, a day mining in the pit, or work in the newly reconstructed Edwardian bakery, teachers and teaching assistants focus questioning towards targeted pupils using Bloom’s Taxonomy to shape and develop higher order thinking and problem solving. Another good example is the increasing STEM programmes that the school engages with. Recently, a local engineering firm spent two days teaching Year 6 children (focusing on disadvantaged girls) about welding and engineering opportunities and mapping out with them a learning path to become an apprentice at one of their UK sites. Nissan also provide the school with a similar programme. For a small amount of pupils premium funding used, the companies often provide a wide range of resources for free. Some of our children come from homes where parents find it difficult to teach their children some of the basics they need for educational success. Over time we’ve developed a very strong partnership with Seven Stories, which is the National Centre for Children’s Books based in Newcastle. They showed us research which demonstrated that successful adults have developed a love and enjoyment of reading, a passion that, if nurtured in pupils at an early age, could easily be replicated throughout a school setting. To establish this, we set up the reader in residence scheme using Pupil Premium funding, which pays for a ‘reader’ for 2 days each week. This work is transforming our children's early reading experience. They work with both parents and pupils modelling how to read with their children and get the best results. The impact is exceptional and ensures our pupils flourish in a broad and balanced educational setting. I often repeat to my staff something Sir Tim Brighouse once told me when he was School Commissioner for London. Schools should not just care about children, whilst they are in school, but they should also care about the individuals those children will become. I’ve really tried to keep that in mind throughout my career and I believe that making partnerships with key organisations creates successful models of work that can be replicated elsewhere; in this sense the Pupil Premium Grant is bringing our North East community together to remove barriers to achievement. We are now showing that we can ensure our children are successful and ready to compete in a global marketplace, which is evidenced in our most recent published results, placing the school in the country’s 100 top performing schools for progress KS1-KS2. On the whole, our curriculum projects are tailored to the individual but tend to focus more broadly on well-being and resilience as well as developing cultural fluency. However, we also use the Pupil Premium to pay for specialist teaching assistants and teachers who target disadvantaged pupils to plug the gaps in basic skills that many children exhibit. It is essential for us to explain in detail to OFSTED inspectors how this additional support impacts on the child’s overall work. Therefore work sampling and measurement of progress is unashamedly rigorous and at least half-termly in frequency, with fortnightly checks on progress and specific programmes such as reading intervention. We have ensured that the Pupil Premium never can be used to prop up an overly expensive staffing structure and have tended to fund more intensive ‘feedback’ learning opportunities rather than generalist support. In a relatively large primary we only have generalist TA support in Reception and Y1, with further funding being targeted to teachers. In the future, we aim to employ a family worker and specialists to start to tackle increasing well-being concerns around the mental health agenda and socio-economic support. While all schools are clearly making an enormous effort to secure the future of our disadvantaged pupils by providing innovative and rigorously monitored support, we should not underestimate the very important task of ensuring our school communities understand the purposes and reasons behind the awarding and use of the grant. While church school values help Northern Saints, it is a challenge for every governing body to identify, shape and share the values that underpin the Pupil Premium Grant with the whole school community. Making disadvantage ‘everybody’s job’ is a key factor to success.